Quality. Affordability. Peace of mind. Those are the three main reasons why drivers are choosing a Certified Pre-Owned vehicle over a new or used car. Choosing a Certified Pre-Owned Kia provides drivers like you with a more reliable vehicle than an ordinary used car - and a more affordable price than a new vehicle. 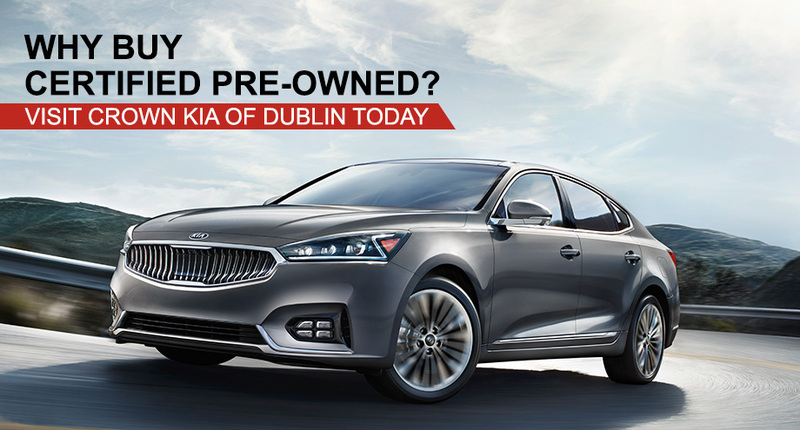 When you buy a Certified Pre-Owned Kia at the award-winning Crown Kia of Dublin, you can rest assured knowing you're getting a quality vehicle with many benefits private sellers and other pre-owned programs don't offer. Discover our available selection of Certified Pre-Owned vehicles when you visit us at Crown Kia of Dublin! Schedule a test drive, or visit our dealership today.